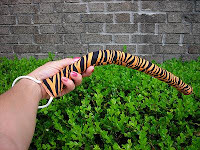 I've finished making my "Tiger Tails". I made 7 full size tails then with the skinnier pieces of fabric I decided to make "Tiger Tot Tails" or "Tiger Wavers" I can't think of anything clever to call them right now. The fabric was originally much more yellow so I dyed it with orange. They are filled with Styrofoam bead balls. 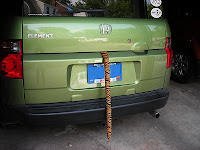 That's DH's car and my car displaying our Tiger Tail and me holding out one of the mini tails. 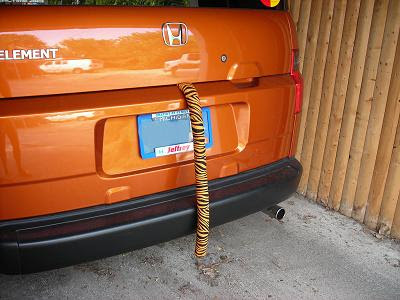 The mini tails will work in the trunk too of course. Pretty neat huh?